Hey, friends! 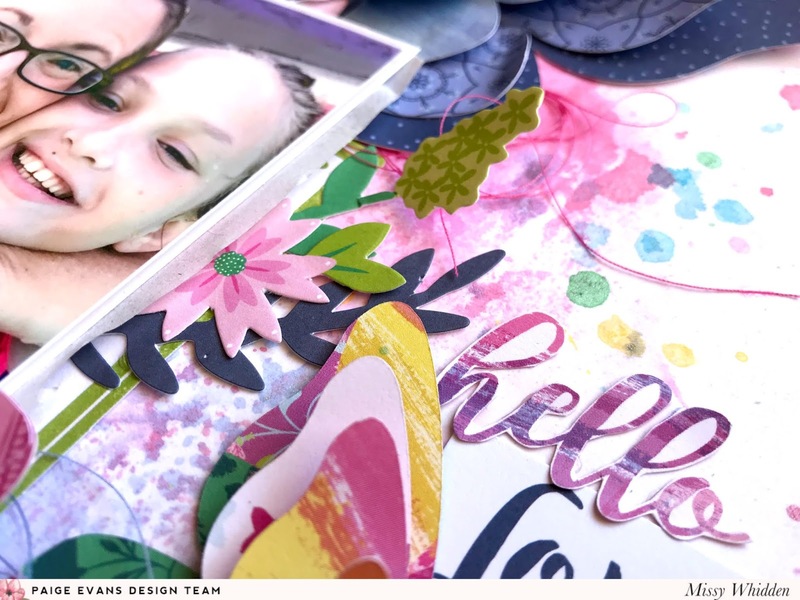 Missy Whidden here with a new layout using the Horizon collection and Paige’s new Layered Butterfly cut file. 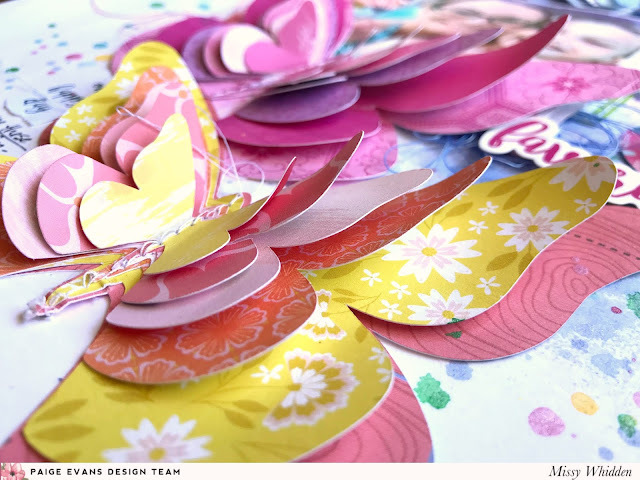 I can’t resist butterflies and this cut file makes some beautiful dimensional design elements! I used many patterned papers to create tone-on-tone butterflies. At first I just wanted three big ones using all pink, all blue, and all yellows/oranges. Once I cut them, assembled them, and placed them on my background, I decided to cut a few more in a smaller scale. I cut a green one and a multi-colored one using even more patterned papers. I machine stitched down the middle of them using white thread and then placed them around my photo. Here you can see how dimensional they are. The wings are easily curled up to give them a realistic look. I used thick white cardstock as my background and used clear gesso on it first. I used some coordinating colors of ink sprays to add some color splotches down. I used the packaging technique to spread the color around behind my photo. I also added lots of splatters. I didn’t want to go too crazy with embellishments since the butterflies took center stage. I used a few phrases from the 2x2 Paper Pads that I cut out and I went simple with the title using one of the Stickers. I also tucked in some tangled thread to add more pops of color and texture around the photo and butterflies. I embellished a little bit around the sides of the photo. Here I used pieces from the Ephemera Die Cuts. I didn’t want to crowd up the white space and have it compete with the butterflies. I also fussy cut the “hello” from Paper 04. These butterflies were very easy to create. It was fun going through all the patterned papers and deciding which ones to use. 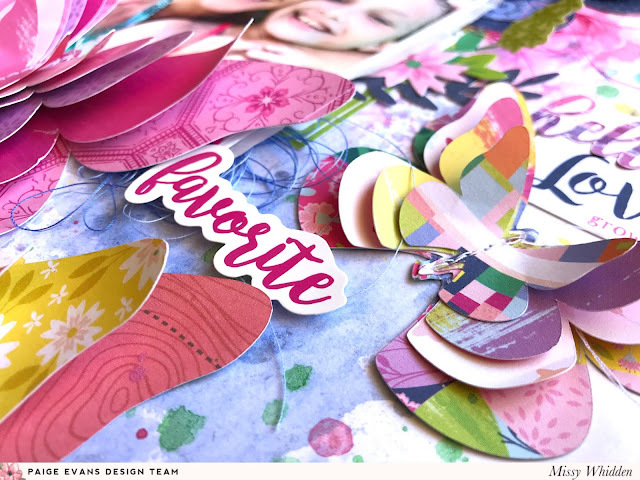 They definitely create a huge impact on the page and I love how easy it was to create dimension with them! I hope this inspires you to give this Layered Butterfly cut file a try. It’s one of my new favorites! I couldn’t wait to make some pretty rainbow butterflies and the Horizon collection is just perfect for that. Be sure to check out my video for even more details! This is so gorgeous! 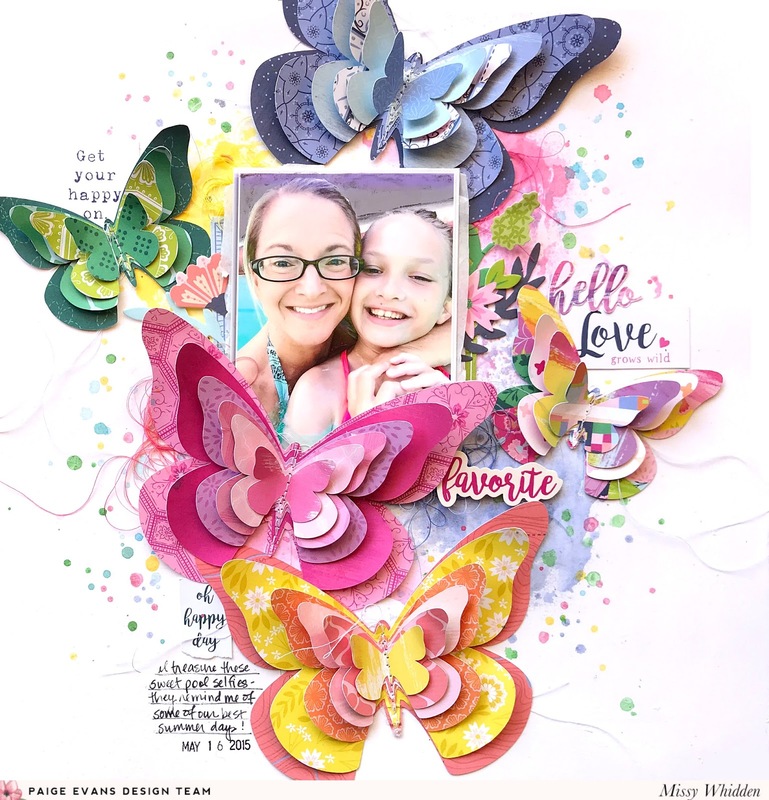 LOVING those layered butterflies!!! !